that we can just use buses, especially new technology buses. In this post, I want to focus that second camp and particularly on that last part. The need for something to be done to improve access to the city centre is increasingly clear. Over the last decade alone, bus use in Auckland has increased from around 42 million trips to 65 million trips, a 52% increase. Much of that growth is to the city centre where combined with more trips on trains and ferries, now more than 50% of people every morning arrive in the city by public transport. With the number arriving by car about the same, it means that all growth in trips to the city has come from increases in the use of public transport, walking or cycling. At various times of the day there are often long queues of buses streaming into and out of the city. All it takes is a slight change or disruption and busaggedon occurs, like it did last week in the image below. This is only expected to become a more common sight in the future as the use of PT continues to rise. Whilst the need for change is now acknowledged, by most, how this is done remains a point of contention. We’re continuing to hear that some within our various transport agencies are wanting bus-based solutions. The primary reason for their opposition to light rail is the cost of building it. 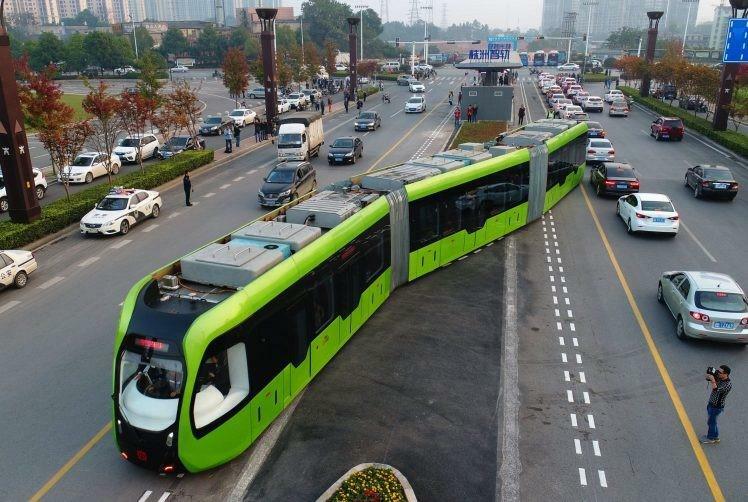 To avoid the cost but also provide more capacity than normal buses, the current fascination is a concept out of China dubbed ‘trackless trains’. In essence this is an electric, articulated, guided bus. The aspect that makes this different from most buses is that it is guided by a set of lines painted on the road. Guided buses aren’t a new technology and there are various different ways of doing it. There are a couple of mechanically guided busways, such as Adelaide’s O-Bahn, that use guide wheels against a kerb to keep buses on track. A couple of systems use magnetic sensors embedded in the road to guide a bus. There are even already optically guided buses, such as in Rouen, France, that like the trackless train proposal, uses painted lines on the road to guide buses. A major concern with many of these systems is that compared to light rail, many of these systems are relatively new and not widely used. Some have already proven to be too unreliable have had to be pulled out. For example, many of the magnetically guided busways have been removed because they were unreliable and an optically guided busway in Las Vegas was removed because it was found to be too difficult to keep the markings clean. This is further exacerbated by the fact that many of these systems tend to use proprietary technology only available from a single supplier. That creates a huge risk of lock in that could come back to haunt us down the road, especially so if the technology is no longer supported. By comparison, there a heap of suppliers to choose from that make high quality light rail vehicles. While the examples mentioned all existed, the has been no shortage of late of other fantastical, and normally stupid, ideas. Let’s not forget the straddle bus which turned out to be a scam, or the bizzare gyro bus, or any number of other future visions being cranked out by various companies. The press for the trackless train claims the vehicle can hold 300 people. This seems highly unlikely given the vehicle is only about 30m long. As a comparison, AT say that a 66m light rail vehicle will hold up to 420 people. The interior of the vehicle doesn’t suggest a huge amount of standing space either and a capacity of 180-200 people seems more realistic. But even if it could hold 300 people, it’s not enough, which is why AT are going for higher capacity vehicles. One answer to capacity constraints would be to increase the frequency but that brings about its own issues. One of the features of the plans for light rail are to use signal preemption so that the vehicles get green lights all the way down Dominion Rd and the city. But this doesn’t work if frequencies get too high or other roads, like Balmoral Rd, would never get enough time in a phase. That then puts you back to the situation we have now where buses can get caught at lights and end up bunched and then platooning down the bus lanes. The frequency issue is even more important in the city where Queen St is set to become a transit mall. One of the advantages of Light Rail, with slightly lower frequencies, is that there will generally be plenty of time when there’s not a vehicle in sight and it will be super easy to cross Queen St. More frequent buses to make up for capacity limitations will make it harder for pedestrians and so compromise on the goals for the city centre. The cost is the big selling point for ideas like this but it’s possible they don’t end up that much cheaper in the long run. The main reason light rail costs so much is the need to dig up the road and strengthen it to handle the weight of the light rail vehicles. These buses, like light rail, are big and heavy pieces of equipment. Driven n a normal busway or road this may not be such an issue due to slight variations in the location within a lane that different drivers have. On a guided busway though, the buses will be in exactly the same location each time, day after day, year after year. This could lead to the need to more regularly repair the surface or potentially even strengthen it just like we’d have had to do with light rail. Furthermore, while disruptive, sometimes it can be worth digging up the road anyway. One of the benefits discovered from building light rail on the Gold Coast was that by necessity they had to replace a lot of aging underground infrastructure. That meant they were able to replace infrastructure like water pipes it with modern, higher capacity versions which in turn unlocked more development capacity. I do think that this technology is promising and definitely worth keeping an eye on, but I’m not convinced that Auckland should so quick to jump on the bandwagon. Let’s at least wait till at least a handful of cities have successfully rolled this out and ironed out all the kinks. Let’s also wait till there are multiple suppliers with inter-operable systems. Unfortunately, even without the capacity/frequency issues that I think would be an issue for the city centre, I don’t think Auckland can afford to wait. We need to get on fixing transport in this city and so should get on with installing light rail as soon as possible. Where I think this technology, or something like it, could be particularly useful is on some of the non-city centre rapid transit routes. For example, running along the Eastern busway to Botany and Howick, from the airport to Manukau and then Botany. Perhaps also some of the slightly lower isthmus routes like Sandringham and Mt Eden Roads. I definitely agree with the sentiment when it comes to those all those bus-like technologies, but I do wonder if there’s a place for battery/capacitor operated light rail in the CBD. It would definitely reduce the visual clutter associated with running the overhead wires, could also make the construction cheaper and faster. Pshem – Auckland isn’t looking at OLE systems (at least from their renderings – looks like they are looking for an inground solution or battery system with OLE only for the non- road sections. I had Deputy Mayor Cashmore ask me the same question last Tuesday at the Planning Committee. I said No owing to capacity and corridor constraints between Manukau and the Airport. Given maintainence would become and issue as well you might as well run LRT down the Southern Airport Line especially as it meets up with Puhinui Station (Southern and Eastern Lines, and Regional Rapid Rail) and Manukau Bus Station (the main bus station in the south). Dig once, build once first time every time. I get the impression that this article was written from the point of view that “trackless trams” are bad and tried to set out to prove this premise. You failed to meantion that the particular trackless system referred to uses both the painted guide lines and road sensors to guide it. It is designed to allow the driver to manoeuvre it round obstacles and even down unmarked roads if required. While I’m not saying that this or another, trackless system is the answer for Auckland, I do believe we should be looking at all potential solutions with an open mind and not try and direct the conversation away from options that are new because we personally don’t like. Them. I’m not saying they’re bad but they are unproven and many other systems have failed so caution is needed. The problem is that every time these ideas come up, those opposed to building proper PT in Auckland, people in various agencies (often Wellington based officials) jump on the idea and want more investigation, which inevitable ends up finding that the original solution was best but we’ve just wasted another year. It’s a predatory delay tactic. Although agreed, its frustrating that these keep coming up, even though they have been looked at multiple times already. Yes there are advantages and uses for both, but in Auckland current situation, they have far to many disadvantages. Not only are they relative new, and therefore have reliability issues as mentioned in the post, but the capacity just does not compare to a tracked system at this stage. I also highly doubt they are in-fact a cheaper alternative. Again all this has been mentioned in the post. But a dedicated route for some kind of bus involves building infrastructure, same as rails, but with none of the advantages of rails- increased efficiency through lower friction etc. And the downside of dedicated bus infrastructure is because it looks like a road, it’s very tempting for people to suggest allowing taxis/electric cars/normal cars to run in it too. Relatively inexpensive to run over its life span. But in area’s where light rail cannot be justified financially, electric buses should be used and of course the technology has been around for decades. In short something that runs on its own road, tracks, because by doing so you avoid large wheeled units that require long suspension travel, that is synonymous with a bus or a hybrid thereof and can have units added or subtracted as per a train. This chinese system is fundamentally a good multi-articulated electric bus with an ‘urban’ configuration with level floor, multiple double doors etc. We should probably use more of those, fancy looking or not. However there is one overlooked but extremely useful innovation in this system we haven’t seen in other advanced buses: the fact that it is double ended with a driving cab at each end. This is extremely useful a terminal stations, particularly places on street in dense city centres. The space required to turn buses around, via a huge roundabout or a ‘drive round the block’ route, can be incredibly expensive and impactful, and a huge source of congestion, unreliability and operating cost. A bus that can pull into a stop, then head straight back out the way it came, would be revolutionary. This combined with high capacity per vehicle/relatively low frequency is one of the great benefits of light rail. While I agree Auckland should not be the test bed for anything new, we should be rapid adopters once a system is proven in service. My view is watch this space very closely. Also I might add some people have been calling this driverless, its not, but it does have most of the hardware systems to become driverless in the future. Currently it is only guided and requires a human driver in control at all times. From what I understand the optical guidance is mostly used to precisely align the bus (do we call is a bus?!) to the platform to give low gap level boarding. I agree with you. I think this system should be looked at closely, in view of building dedicated road lanes and/or busway systems like the Northern Busway, whether it is in Auckland, Christchurch, etc. Watching the You tube video ( https://youtu.be/Lqgvk6LWUDk ), I could see this working in Auckland initially from the City to Airport, if it had its own dedicated road lines from the city to Mangere and a dedicated bus way from Mangere to the airport which is part of the proposed city to airport light rail system. I wonder if the Government, NZTA and AT would turn down an offer, it the Chinese were to pay for a city to airport system to prove it will work, since Chinese banks and investors are keen to fund major infrastructure projects in NZ? You can never have too much capacity. Indeed, calculations in our part of the world are usually based on standing passengers at 4 people per square metre. In Asia and other places they use up to 8 people per square metre. On a transit vehicle that has the majority of the floor area dedicated to standing, that simple shift can double the ‘rated’ capacity of a vehicle. Axle loads are an issue in NZ, we’re technically not allowed to load our double deckers up to capacity because the gross weight of all those people exceeds the axle limits. You could probably get around this axle limit by converting trucks that carry regular old shipping containers into passenger chicken coops? This is something people don’t realise, a fully loaded double decker bus has higher axle load than a fully loaded H plated truck (due to overloading). Need to either design a pavement to handle this load, or a track. Either-way its not cheap. Yes saw a packed full north bound train at Papatoetoe go “out of service” this morning at 7:43am due to being full enough it appeared (don’t’ know if it was southern or eastern). Was pretty full but wasn’t standing people at the ends etc and not that tightly packed. One thing that is always overlooked when comparing these things is permeability. Although this is very much a perspective influence on peoples decisions, when the public look at non-tracked solutions it gives the impression council can easily change things / routes etc as they feel. Where a tracked vehicle gives the impression that the route will remain for the foreseeable future. The key here is this encourages more intensification around surrounding land use on LRT routes. As some have mentioned, the post does read as if it is justifying a predetermined point of view. In saying that, I fully agree with the conclusion. There are benefits of both tracked and non tracked transport, to me the greatest benefits comes in the indirect benefit of land use confidence provided to developers. Something that non-tracked transport cannot provide to the same extent, unless its a northern busway type investment (in which you have the same disadvantages of a tracked system without the efficiencies, e.g. road space taken up). It seems only yesterday that the latest fad was the Straddle bus. I wonder what happened to that? I’m pretty sure the Straddle was a giant failure, or rip off, or both. Would be keen to know more, but I did read that it crashed into cars, etc, caused mayhem, and that the whole thing was a farce. Pretty much as expected, but more than happy to be proved wrong! I want Thomas the tank engine faces! How does that look painted on the front of a monorail? I don’t think in terms of cost savings, I think in terms of increased benefit. For example, if using these buses we could do 10 lines for the price of 1 LRT line, then the buses probably give more of a gain overall. Yes there would be a lot of compromises, but surely giving 10 times the people access to good PT is better than 1/10 to great PT. Is there any evidence they would give any cost savings let along 10 times the saving? Good article Matt, and an interesting glimpse of just *part* of the baffling array of possibilities that get presented as solutions to transport problems. Presumably monorails, personal pods and narrow-track vehicles are still viewed by some as the answer we’ve all been waiting for. However there is one basic guideline which I feel we should not lose sight of. This is that mass rapid transit works by-far the best, and also avoids a multitude of safety and amenity impacts, if it runs on its own exclusive right-of-way. This rules out anything that shares space with other traffic, pedestrians or cyclists. Such sharing can work fine for non-rapid, lower-density transit, but we must be wary of assuming that an exculsive right-of-way can now somehow be dispensed with from modern public transport applications. When considering social and environmental impacts as well as speed and capacity, the most successful and effective mass transit applications are urban metro systems which run in exculsive corridors, either underground, elevated, or fully-fenced. If there are advantages in swapping steel rails for concrete strips with dotted lines then by all means let’s consider this, but the supposed cost-advantages of these alternative systems over traditional rails are likely to evaporate in the basic necessity of providing that all-important exclusive right-of-way that proper mass rapid transit needs. This is why I think Dominion Rd should largely be built as cut & cover rail. Exclusive right of way allows for speeds greater than 50km/hr. Tunnel also provides service corridor for utilities, water, power, comms. And the cost about a billion dollars a kilometre. Do we have eight billion bucks to spare? New Zealand’s massive mistake, as with much of the world since the shift to motordom, has been its failure to plan and reserve PT corridors through urban developments. Had this been done, then installing quality rapid transit services would be as cheap as chips. Although a network of thoroughfares exists in the form of public streets which can also support PT services, these are a poor-substitute for dedicated rapid-transit corridors. We squandered the opportunity and as Nick R says, we are now faced with $1bn/km costs for things like the CRL (though bear in mind this figure includes much more than just the basic tunnels; threading a route through the ‘burbs instead of the CBD would likely be much cheaper per-km). I suspect we will eventually have to bit the bullet and do it, just as the major Australian cities have done or are still doing. But even if we can’t afford it now, we could still be planning and designating PT corridors for future use. If we were smart. That’s how motorways can be bulldozed through, often with little to stop them. Liz Allen’s photo reminded me of a question I often ask myself when in the CBD: why do so many buses not use the allocated bus lanes? It’s usually because the buses need to turn left or right, to pull into or leave a stop, or to move around another bus that has stopped for passengers. In the case above, you have all of the above happening. In most cases the bus lane is a nominal kerbside thing that runs between, but not through, intersections… seemingly designed to avoid distrupting traffic access to intersections more than anything else. Some of the time it is faster and less disruptive for the bus driver to not use the lane, a lot of the time there simply isn’t a bus lane to support the route the bus must take. Another thing is on some routes the curbside bus lane is a lot bumpier than a centre lane & off peak don’t always need to take it. Just let us get on and build the *insert expletive here* LRT system already with proven solid technology with huge capacity. No more delays and useless pondering on these half useless pretending to be LRT buses. Why should Auckland try and lead with new technology when it’s already 30 years behind other major cities and a simple catch up with proven tech would bear massive improvement? One thing that has only briefly been mentioned is that a steel wheel on a steel rail has much lower rolling-resistance than rubber on tarmac/concrete, therefore much more energy-efficient. Indeed Robin, that’s one of the reasons light rail has low opex, using (domestically-generated) electricity and less of it than buses burn diesel to trade the same distance. Even kids can get the difference – set up a crate of water bottles alternatively on rubber wheels (several kids struggle to move it) and rails (one kid can move it easily). Why is it, then, that we are so allergic to the capex to get urban transport right? In certain corridors (yes, such as Dominion Road to Onehunga, Mangere and the airport), light rail is a sure fire winner. Let’s get it done! The fuel consumption vs. electricity consumption is a small factor, and the relative difference between rolling resistance is a tiny factor in operating cost. Practically speaking even a dumb old diesel bus running a bus route is a very fuel efficient machine with very low consumption/costs per passenger. By far the greatest factor is actually the staffing rate per passenger, or in other words the capacity per vehicle. Large vehicles with lots of people on board are very efficient to run. Put another way, compare a 300 passenger electric bus with rubber tyres and a 300 passenger electric tram with steel tyres, on the same route and conditions, you’ll have negligible difference in operating cost. I would have thought that a bus would have higher rates of wear and tear on things like shock absorbers (due to road surfaces being not as smooth as rail), tyre costs would be a considerable cost compared to steel rail, road surfaces would need more maintenance as well compared to steel rail which has a far far greater lifespan. Granted these aren’t necessarily a huge difference in the overall scheme of things but they do make a difference to the ongoing opex. Back in Victorian England (c1870) they went from horse-drawn buses to horse-drawn trams. The same horse could pull twice the load on rails. Wear is greater in a bus, at least a diesel version. Average life expectancy in the United States is about 12 years. At the same time, it’s not uncommon for rail cars to go nearly three times that long, and really older equipment is not unknown, in some cases going for over half a century and even longer. And let’s remember what the steering mechanism in this must look like–and recall that you have elegant, simple passive self steering in a rail application, combined with that low rolling friction that approaches that of “frictionless” maglev. I think it’s a little unfair to label buses leaving the city as ‘busrageddon’. I seem to recall recently that a single train derailed at a multi track section of the heavy rail network causing commuter chaos. Now image a broken down tram (and you can bet your bottom dollar it will happen) on a in/out track system. At least with guided buses similar to that in the article you can easily bypass the broken down vehicle if necessary. After seeing a presentation on the Chinese system it appears to stack up quite well against a LRT system. Yes there are question that need to be asked, however for a network that is currently being proposed it can handle the grades much better than a LRT. How steep are the grades you’re looking at? For self propelled rail cars, you can go much steeper than for locomotive hauled trains. Those electric motors, especially if they can draw from wires instead of batteries (more power available), can also provide superior hill climbing speeds compared to a diesel bus. Grades on the order of 1 in 25 to even 1 in 16 are fairly common in hilly cities like Pittsburgh, Pa. The same city once had a tram line on an amazing 1 in 7.6 that was abandoned outright because buses couldn’t negotiate it!! I have been a strong rail advocate for many years including pushing for a rail revival in Aukland at a number of public meetings. I have now become an advocate of the Trackless Tram as I believe it does what a train does to a city with its fixed, fast, high capacity route but at a fraction of the cost. I went to see it in China and am convinced it is the real deal. The CRRC took six innovations from the autonomous high speed rail systems that they have developed so successfully and put them in a bus to make it more like a train. It is a very high quality ‘tram-like’ ride and most of the issues raised in the article here are unlikely. For example the Trackless Tram is half the weight of a diesel bus as it does not have the heavy motor so it is not going to make an impact on the road surface. Most of all I believe it will unlock land development at stations as it is so quiet and fixed due to its electronic ‘track’ and recharging facility; the three carriage systems will bring up to 300 people (easily imaginable with the kind of standing room available) quickly and easily, enabling walkable station precincts with interoperable electric systems for autonomous shuttles. I believe it will be the kind of transformation that cities like Auckland and Perth are needing as it will unlock regeneration of centres back into inner and middle suburbs and connect across the city. I urge Auckland to join the Trackless Tram transformation. That 300 people is based on some very ambitious, dare I say Chinese, standing levels (i.e. over 6 people per m2). If you use a more Australasian standard of crowding, the capacity is more like 150 people. Does anybody know if the CRRC trackless tram can be coupled together to make a longer vehicle. If that was possible if would make it very comparable to the 450 pax light rail that is proposed. Check out Trampower UK trampower.co.uk who have developed the City class lightweight tram, lightweight overhead lines and a relatively quick to lay prefabricated rail LR55 that can be cut into existing tarmac and road bed without the need to divert services (as it is lightweight). With shared road lanes (trams and cars), a conventional tram is better as the trackless tram which needs a high quality road surface for both ride comfort and guidance that can be damaged by heavy car and truck use. A tram does not create particulate pollution from its rubber tyres and its steel wheels are ~3 x more energy efficient. We do not know whether the trackless tram which potentially can be re-routed will give developers confidence to invest in urban renewal along the route. That’s really interesting. Seems credible. Inductive power charging at stations and you don’t even need lines for most of the way. Any power technology–batteries, inductive charging, whatever–is equally adaptable to a rail vehicle. And the rail vehicle has a HUGE advantage in low rolling friction and a simple, indeed elegant, passive self steering system, and one that works through the whole car–and in a train. A major source of city pollution is from rubber tyres – they produce much of the small cancer producing pm2.5 particulates, but also heavy metals and grime that coats buildings and car surfaces and ends up in our harbours but is not mentioned here. Another interesting comment in the article, was that guided buses would need to have the surface strengthened on roads where the wheels plied. That means digging down as you would if you were putting in steel rails. It should be noted the large buses put far more weight on a surface area through their types than a light rail vehicle where the weight is spread over a steel line, leading to higher road maintenance. I wouldn’t say tyre wear was a major sorce of pollution when there are much worse cancer causing pollution sources such as many thousands of diesel engines spewing out obnoxious gasses. Maybe after the real major polluters are resolved then tyres could be looked at. I also doubt it would be necesary to ‘dig down’ to install special road surface for guided busses. Since they would run in designated lanes then overall surface wear should be well below normal road with HGV traffic. In any case if there road surface was compromised then normal highway maintenance would resolve such issues. If they are guided and follow exactly the same line every time the road bed will definitely need to be strengthened, this would be a problem even if driverless cars were following the same line. An alternative is to have them programmed to follow a slightly different line each time much like a bus with a driver does, however this requires a wider lane for the bus, which is an issue if corridor width is a problem. Since the bus rubber tyres will have a very large cross section and footprint compared to a flanged rail wheel then road contact point loading will be significantly lower than a steel wheel on a steel track. Since a road installed LR track will not be on ballasted sleepers then a strengthened concrete case will be necessary to support the track. Of course road loading would be further mitigated if, as you suggest, there was programmed adjustment to the actual tracking. Bogle – the sources that I have read indicate the larger buses produce significant wear and tear on roads, if they followed identical tracks, this would proportionately increase. The main benefit of steel tracks are the spreading of loads, and light rail is of course comparatively lighter than heavy rail, thus needing less work laying the tracks, and relatively low maintainence. Check with WCC about the extra cost of double decker buses running through the golden mile in Wellington. Paul, yes larger buses and goods vehicles do cause significant road wear. Most main roads are already designed to handle such loads. However, I’d agree that if the guided bus was on a secondary road then like an LR track some strengthening would be necessary. I’m not sure there is much difference, if any, between HR and LR rail loading or the actual laid track. You can easily see the ruts in the bus lanes on Symonds street. They are both major sources of pollution. It all ends up in the bottom of our streams and harbours. Manners Mall was strengthened to cope with buses running constantly over same piece of road, and they spent nearly a year on upgrading it. Light rail spreads the load over a long piece of metal. Light rail is more expensive, but you get what you pay for! I disagree with arguments of a technology lock in. In fact I believe the opposite if we choose rechargeable battery driven trackless trains. It provides the ultimate in flexibility If you want to see a technology lock in look what has happened as a consequence of New Zealand’s original choice of rail gauge. Our railways have been hamstrung ever since. We can’t even run fast commuter trains from Auckland to Hamilton unless we get tilt trains. We have also chosen overhead wires for our electric trains – not too bad in our current rail corridors but such infrastructure above ground down Dominion road would be an egregious eyesore. With the savings on set up cost of trackless trains we could not just be looking at Dominion Road or Puhinui Road or North Shore but Dominion Road and Puhinui Road and North Shore right on the existing busway for very little cost. We failed to uptake rail when we should have. Let’s make the technology hop now while the drawing board is relatively clean rather than putting something in we quickly regret and then spending decades looking enviously around the world caught in the tension between wanting to rip it up and not wanting to lose our sunk costs.